It is only used for a short season, it needs more than average attention to keep it rust-free and working well, and it doesnt have an air-conditioned cab but is it time to invest more time and money in nitrogen application equipment? 3) the improvements in nitrogen use efficiency that may be gained by application timing (i.e., pre-plant versus sidedress). One of the issues that continues to get examined within nitrogen systems is how timing of application can impact nitrogen use efficiency. If we applied fertilizer nitrogen in the fall like some other jurisdictions in North America, recommending a switch to spring applications would be relatively straightforward, and fairly well supported by research findings. But for us the key question is the comparison between pre-plant and sidedress application. Ontario research and recommendations have traditionally supported sidedressing to be 20% more efficient than pre-plant application, but only in areas west of Toronto and greater than 2800 CHU. In other areas of the province, the differential did not seem to exist. Some interesting and more recent research from Minnesota has compared nitrogen use efficiency for corn following soybeans where a one-pass field cultivation system is used. The research was conducted by Gyles Randall and Jeff Vetsch from the University of Minnesota at Waseca MN. After two years of a three-year study, they found no difference in corn yields when nitrogen (100 lbs N/acre) was applied pre-plant regardless of whether the nitrogen source was anhydrous ammonia, urea (broadcast and incorporated) or UAN (broadcast and incorporated). However, they did find significantly higher corn yields (approximately 10 bu/ac) and better nitrogen use efficiency if they split this application into a planting/sidedress combination where 40 lbs/acre was either sprayed on top or dribbled beside the row at or near planting time and 60 lbs N/acre was then sidedressed later in the season (56 leaf corn). About five years ago, Ian Greydanus of Grafton made the decision that he was going to put some extra resources into improving his nitrogen application system. This process led him to select anhydrous ammonia as his nitrogen source, and in turn he decided to purchase his own tank/wagon combinations in order to keep the applicator supplied and operating smoothly. Greydanus then made the decision that he considers to have been the key to his satisfaction with his new nitrogen application system, the purchase of a radar-driven flow monitor (Raven 440) for the applicator. He has been very happy with the ability to select and maintain application rates even when tractor speed on some of his rolling ground is difficult to maintain. He invested approximately $5,000 in the controller five years ago, but when he considers what he has invested in many other aspects of his cropping operation, it seems like a very justifiable expense. 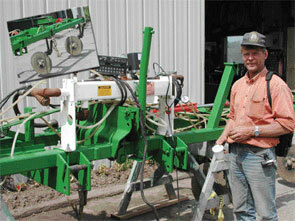 Ian is also quite happy with the applicator tool bar that he purchased used and then modified. The most noticeable of these modifications was a switch to a skip-row shank pattern which allows him to pull 7 shanks on 60-inch centres and apply 35 feet in a pass. This applies nitrogen to 14 rows of corn with a knife running between every other inter-row. Applying 100 acres in an eight-hour work day is not a challenge for the unit. The skip-row design also allows the application tractor to be smaller and duals are not needed. Ian Greydanus of Grafton, Ontario is pleased with the application precision and capacity he has obtained with his 35-foot, skip-row (see inset) applicator. Greydanus has been actively involved with the Quinte Region Soil and Crop Improvement Associations project looking at the value of taking soil nitrate tests (PSNT) in order to adjust his nitrogen application rates based on the residual nitrate in the soil. In 2002, on a field that received poultry manure the previous fall, the soil test recommended about 50 lbs more nitrogen per acre than he would normally have applied. The various rates of nitrogen applied in strips across this field did indicate that the additional nitrogen was warranted, however. Greydanus is encouraged by the results and sees the PSNT as another tool in trying to improve his nitrogen application efficiency. As we have continued to try and verify the value of soil nitrate testing in Ontario, it has become apparent that one of the real benefits of sidedress applications compared to pre-plant applications is time. Time allows for manure and legume nitrogen to mineralize in order to get a better indication of total fertilizer nitrogen needs when a soil sample is taken in June. In assessing nitrogen strategies, corn producers should consider not only how to secure the cheapest supply of nitrogen and apply it in a timely fashion, but should also think about how economic and environmental benefits can be achieved by spending some additional time and/or money improving rate selections and application uniformity.